Last year, Ubisoft shook the very foundations of one of their most successful franchises with the release of the absolutely stellar Assassin’s Creed Origins. The soft reboot of the series took fans back to the beginning of the epic AC saga and introduced a whole swathe of new gameplay mechanics, characters and settings to breathe life into an otherwise stale flagpole title. 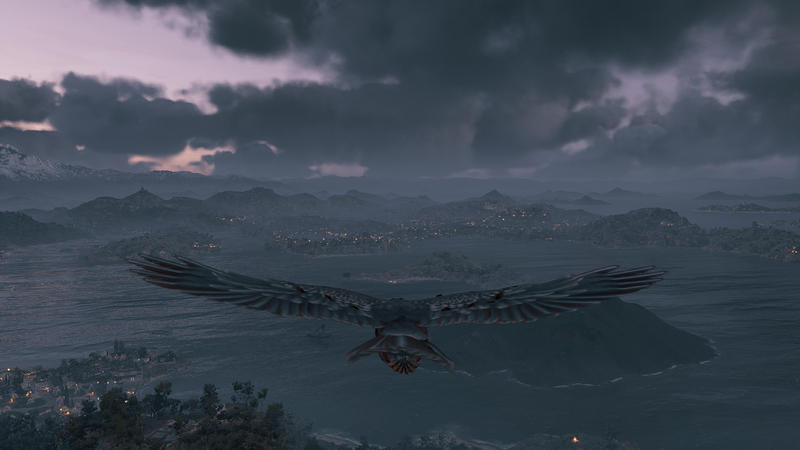 Developed alongside Origins, the latest instalment, Assassin’s Creed Odyssey, aims to continue the momentum of its predecessor and to prove that the tale of chaos versus order is only just getting started. How you answer is up to you! 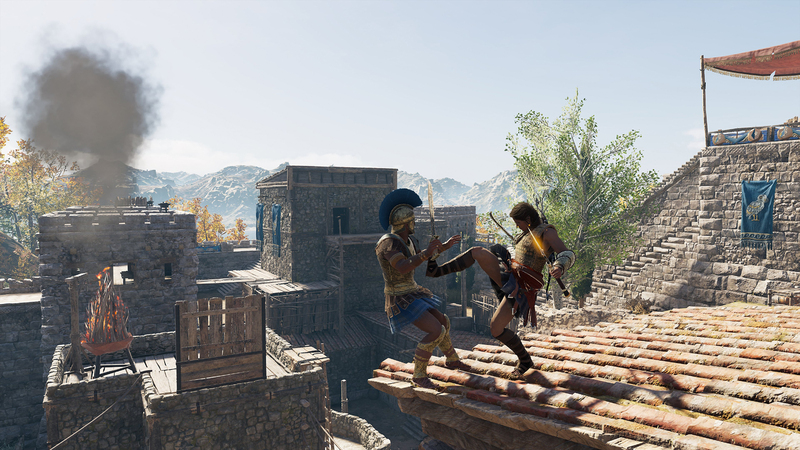 In one of many firsts for the series, you begin your odyssey by choosing to play as either Alexios or Kassandra, a descendant of the mighty King Leonidas (of 300 fame) and mercenary trying to make ends meet after being exiled from Sparta as a child. The realm of ancient Greece is being torn apart by the bloody Peloponnesian War between Athens and Sparta, and the actions you take on your journey will shape the future for all. The choice of who to play as is purely preferential as they share the same story and abilities. 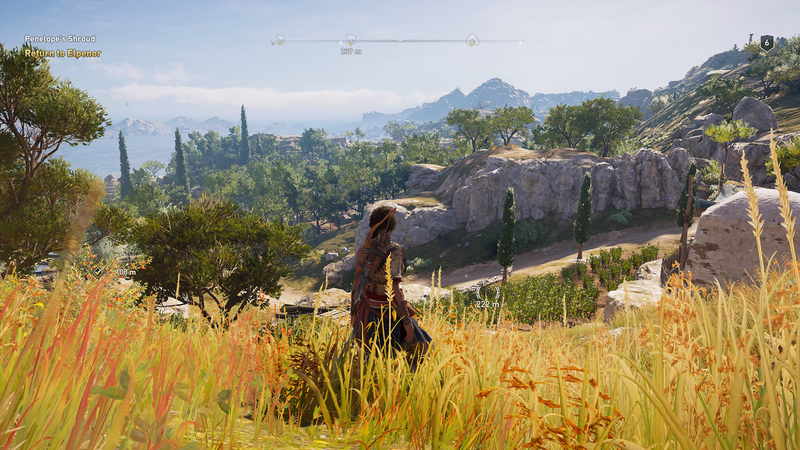 I chose to play as Kassandra, so to keep things simple for this review I’ll refer exclusively to her going forward. 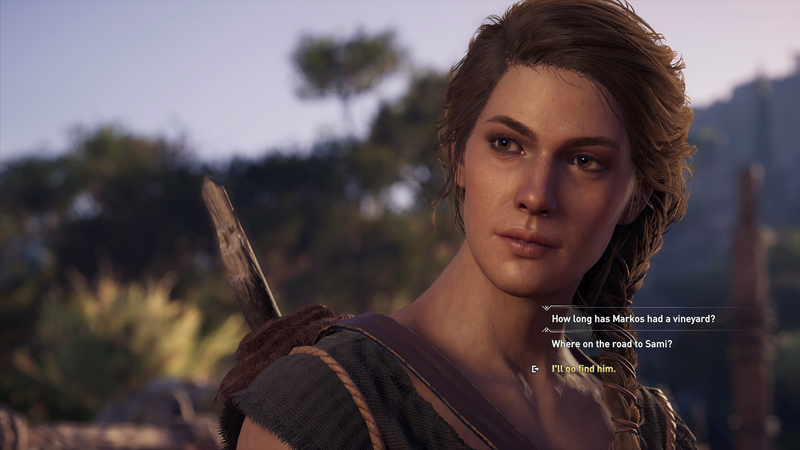 Following on from Origins’ Bayek (arguably the best character in the series) is no easy feat but Odyssey has gone to great lengths in order for you to feel invested in Kassandra’s story. She is smart and funny, but not without her own flaws, and her lovable roguish charm makes her feel decidedly down to earth and relatable. 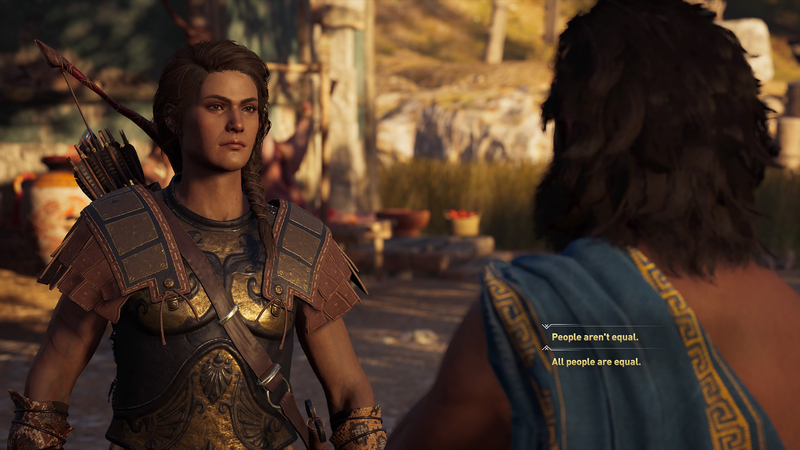 Odyssey also introduces dialogue choices into the game, which allow you to interact with NPCs in a more personal way, impacting both the conversation at hand and creating potential consequences in the world at large. Will you be a hard-nosed mercenary who stabs first and asks questions later, or will you try to solve your conflicts with a more compassionate or reasonable approach? The decision is up to you. You’ll also have the option to romance some of the other characters in the world, proving that you can be both a lover and a fighter. 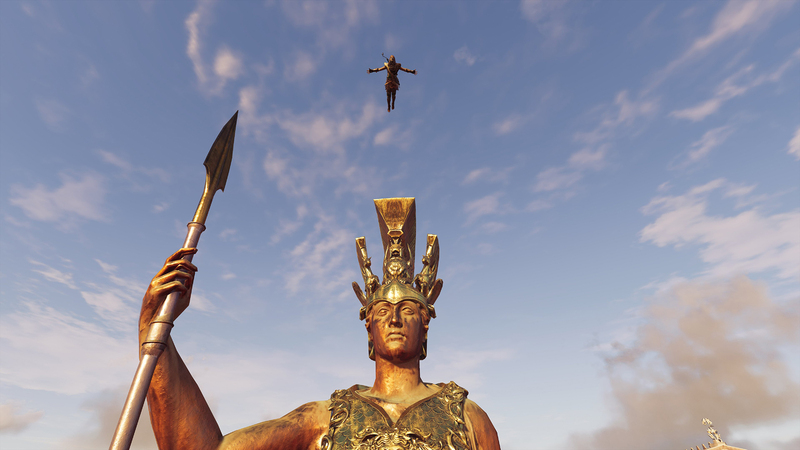 From a narrative standpoint, Odyssey once again takes its cues from Origins and makes the story more personal to Kassandra, at least initially. While Bayek’s tale was one of vengeance and loss, Kassandra’s journey is about seeking answers and trying to find her place in the world. Don’t be fooled though, there is enough mystery and classic Assassin’s Creed conspiracies to keep even the most fervent lore nerd (like me) happy. Instead of giving you a clear purpose or antagonist from the beginning, Odyssey instead weaves a clever web of intrigue and deception that gradually unfolds as you progress and continues to surprise even after hours and hours of play. All of these cloak and dagger exploits are of course taking place amongst the very brutal Peloponnesian War, which you can also take a very active part in, either for profit or for a sense of duty. You can choose to fan the flames of war by fighting alongside Spartans, protect the fledgeling idea of democracy with the Athenians or fight both and make some serious bank doing so. Along the way, you’ll cross paths with historical heavy-hitters such as the ‘father of history’ Herodotus and the great philosopher Socrates as they shape the future of Greece and society as we know it today. 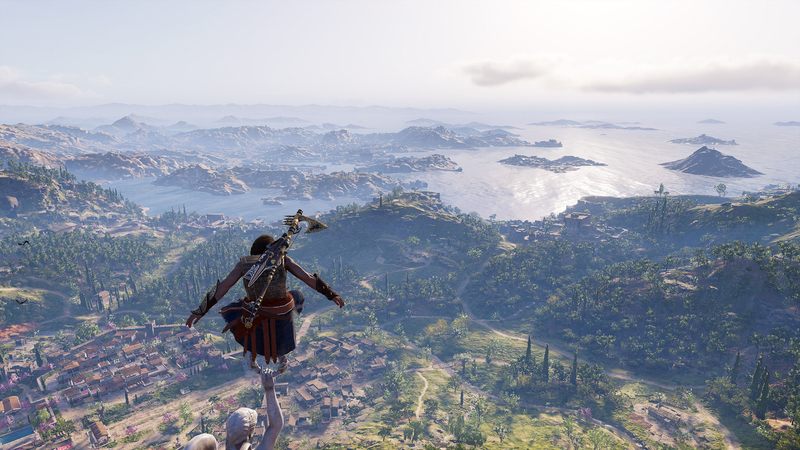 Speaking of Greece, the developers have done a fantastic job at recreating the gorgeous open world, and sea, of the beautiful and vast Mediterranean nation. Although it is perhaps not as immediately visually striking as ancient Egypt and the Great Pyramids of Giza, the attention to detail in the environments rivals that of Origins and each region and island is teeming with colourful flora and fauna and countless nooks and crannies to explore. From the somewhat subdued starting island of Kephallonia to the glistening metropolis of Athens, it always feels like there is somewhere new to discover just over the next hill or across the sea. The new ‘explore mode’ is an optional setting that forces you to actually explore the world and find your objectives within it, utilising your beloved eagle friend Ikaros. This may sound a little scary at first, but the game provides you with enough clues and suggestions to make it a fun new way to play, rather than just shoving a quest marker down in front of you. For fans of Assassin’s Creed Origins, the core gameplay mechanics will all feel fairly familiar, but newcomers to the series can expect a surprisingly decent RPG heart at the centre of this game. 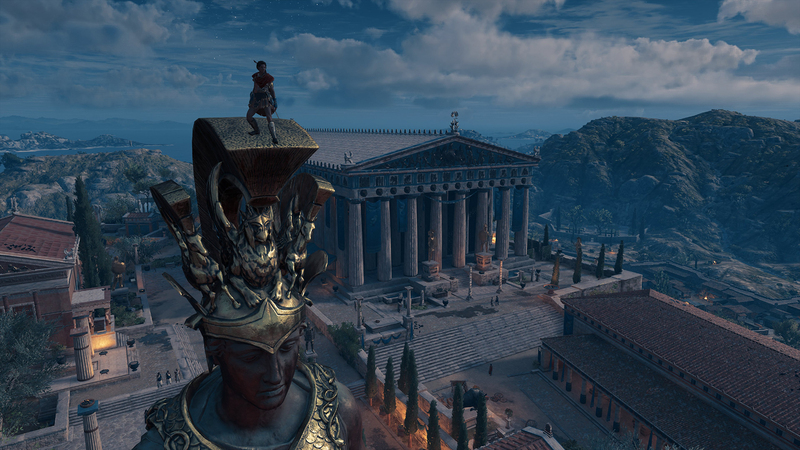 As you fight your way across Greece and complete quests, you’ll earn experience points, level up and acquire various pieces of gear. Each time you level up, you’re given an ability point, which you can invest in one of three skill trees, depending on your play style. The Hunter tree favours attacking from afar with a bow, The Warrior tree is all about getting up close and personal with high-powered attacks and The Assassin tree is for those who like striking in the shadows and poisoning their foes. Don’t worry if you like the sound of all three though, because you can unlock and utilise any of the abilities you fancy and can even reset your spent points for a small price (of in-game currency). One ability I highly recommend is the ‘Spartan Kick’, which does exactly as it says and feels suitably epic. Believe me, Spartan kicking a heavily armoured enemy off of a cliff never gets old. Combat is, again, similar to Origins in that it is much more tactical in its approach than previous entries. Enemies no longer wait on the sidelines while you dispatch them one by one, instead, they rush you and do their best to put you down quickly. You have to know when to strike, when to parry and when to dodge, otherwise your odyssey will be over rather swiftly. Landing attacks and successfully parrying will build up your adrenaline meter, which allows you to unleash the aforementioned devastating abilities. It can take some getting used to, but just remember that there’s no shame in running away and ganking your foes from behind, this is an Assassin’s Creed game after all. 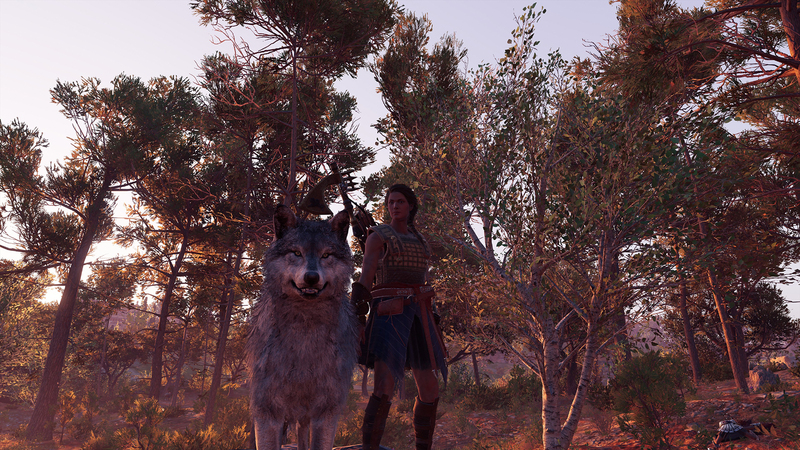 As in Origins, you can also equip Kassandra with various bits of armour and weapons that you pick up along the way in order to increase your chance of survival in the harsh world. You can arm yourself with swift daggers to overwhelm your enemies in a flurry of blows, a trusty sword for your standard hack and slash or even a massive club to really bring the pain. Thankfully, bows have been simplified since Origins with things like multi-shot or predator mode being moved to abilities instead of gear types. A new feature called engraving allows you to enhance equipment you like the look of with stat boosts unlocked by collecting other sets or completing milestones, like defeating 50 archers etc. This is great because it means that you aren’t stuck using an ugly chest piece for instance, just because it gives you a boost to your melee attacks. Can anyone guess Kassandra’s favourite superhero? 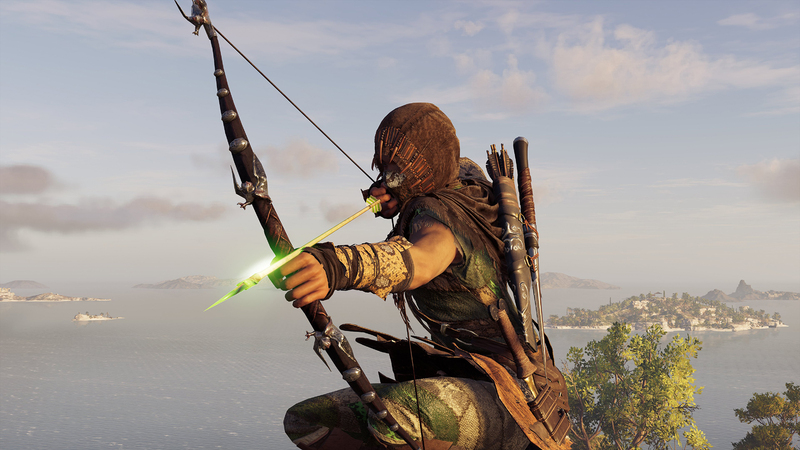 I’ve spent the majority of my time saying how similar Assassin’s Creed Odyssey is to Origins (because it’s so great) but it also has a lot of new features that really set it apart. The most prominent of which would have to be the inclusion of a fully realised naval combat system. 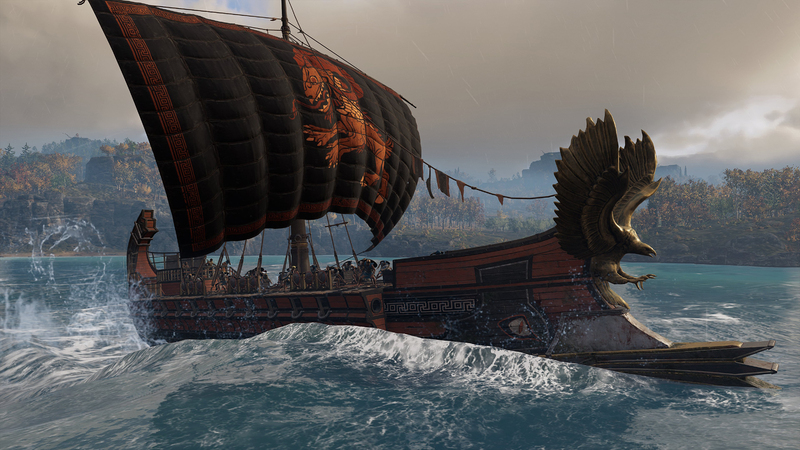 Early in the game, you are given the keys to your very own Trireme warship, The Adrestia, to sail around the Aegean Sea and all the islands within it. Danger lurks over every wave though, with clashes between Spartan and Athenian ships everywhere and of course, pirates making the most of the conflict. You can engage in ship-to-ship combat with practically anyone you come across, peppering them with arrows and javelins or ramming into their hull at full speed. Once you’ve done enough damage, you can board their boat, kill the crew and scuttle it for treasure and resources. Those resources can be used in turn to upgrade The Adrestia, giving boosts to her armour and damage capabilities. You can also customise the look of your ship, the figurehead and crew to make it feel like your own home amongst the great blue sea. Another cool feature of the ship combat is that you can knock out and ‘recruit’ pretty much any NPC in the game, who then crew The Adrestia and give her additional bonuses to various stats. To draw another comparison, it plays a lot like the naval combat in Assassin’s Creed: Black Flag, albeit simplified and streamlined. 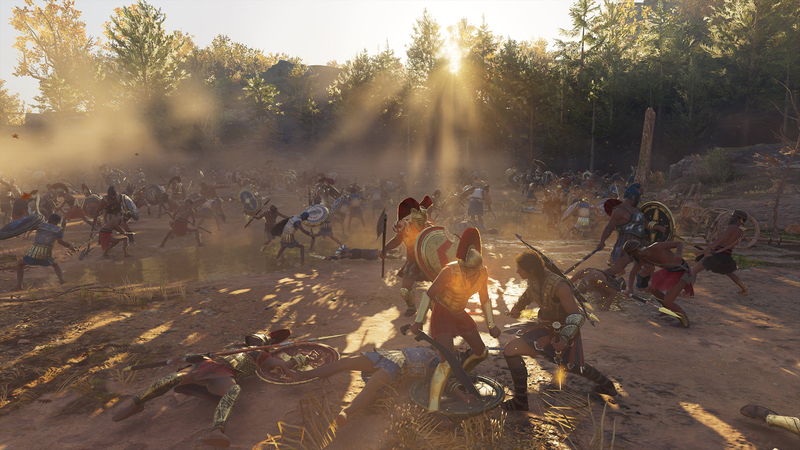 Another major difference in Assassin’s Creed Odyssey is the war between Sparta and Athens, and the role you can play in the conflict. Spartan or Athenian forces occupy each region and, if you want, you can take actions to destabilise the power structures and profit off of the ensuing skirmish. The regions each have a national leader and through killing the occupying army, stealing payments or destroying supplies, you can weaken their influence over the area until they are eventually turfed out onto the street. Once you dispatch them, you have an opportunity to engage in a large-scale fight as either a defender or an attacker, with some pretty decent rewards on offer if you do. These actions aren’t necessary, however (outside of some story missions) and regions can change hands organically and randomly as you progress, even without your involvement. The last thing I want to mention that sets Odyssey apart is the Mercenary system. It’s a sort of hybrid between the Phylakes of Origins, the Nemesis system in Middle Earth: Shadow of Mordor and the wanted level of Grand Theft Auto. Your nefarious deeds in the game will force the wronged parties to place a bounty on your head. The worse you are, the higher the bounty, and there are many other mercenaries around Greece who will happily claim the price on your head. 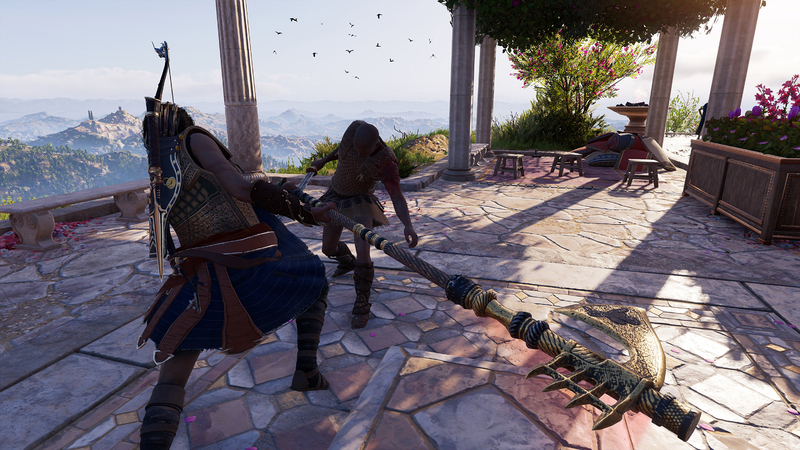 Since Kassandra is also a Mercenary, each time you encounter and defeat these bounty hunters, you move up a level in the ranking system, which can be accessed in your menu screen. The higher your ranking, the more rewards and discounts you receive and when your level is high enough, you’ll even be able to enter the combat arena for more fights and even more rewards. I do, of course, have a few grumbles to air out, but nothing that feels like a huge setback. The biggest thing I noticed is that Odyssey really hopes you’ve played Origins in order to understand a lot of the narrative and gameplay elements. While I never really felt lost while playing, it does take a little while to get the hang of things and newcomers may have a hard time initially. There is also the odd animation glitch, frame drop, repetitive gameplay loop or shoddy voice acting, but overall it feels like a stable and well put-together game. I couldn’t stop taking photos, okay guys? 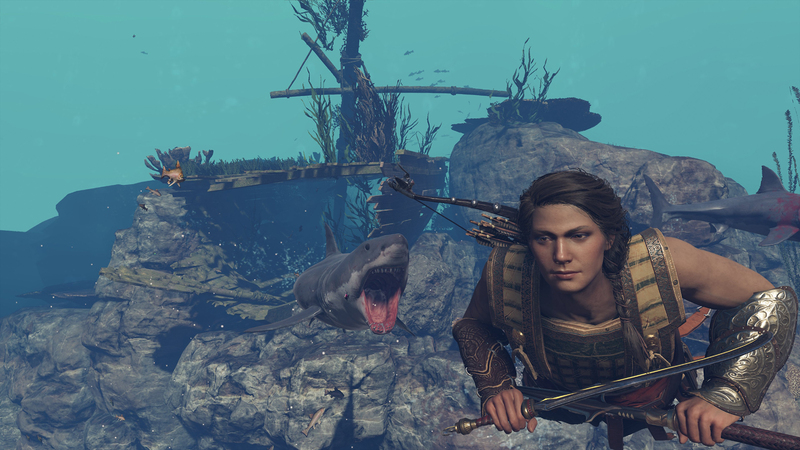 Assassin’s Creed Odyssey is a worthy successor to Origins and a fantastic game in its own right. 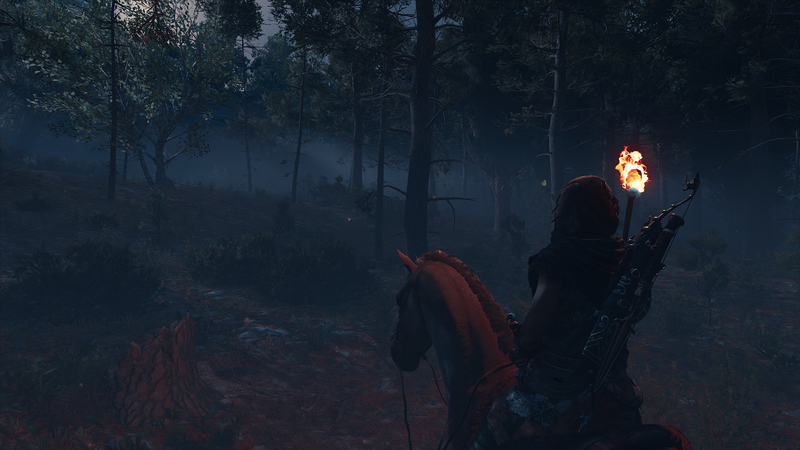 There really is so much to do in this game and on top of everything I’ve mentioned, there is plenty more to keep you busy, like heaps of side quests, legendary animal hunts and secret chambers to explore (with some pretty terrifying and mythological occupants). There are a few other tasty things that I’m not allowed to discuss in this review but believe me when I say that you are going to be spending a lot of time with Odyssey and you’ll love almost every second of it. The Assassin’s Creed mystery deepens!